A short 3 minute video tip for you to help make your marketing videos as addictive as cat videos. We’d love to hear your thoughts and questions so please leave a comment below the video or drop us an email. We read every message. Feel free to pass this on to your friends in business who you’d love to see get their message out in a more powerful way. You can get it over here for free. Hey there, pussycat. Janet Beckers here with your Cool Cats TV Tip of the Week. Today, we’re looking at another mistake that is really common for people to make when they’re creating their videos for their marketing, and this is to do with what you’re actually saying. Let’s have a look at that. One of the biggest mistakes that people make is they ramble on and on and on. They do not have a structure to the way that they’re going to present the content that they’re giving to their clients. Is this a problem that you have? I know it certainly was for me when I first started creating video. I would just rabbit on for too long. What’s the solution? Well, you need to have a template. You need to have a structure that you can follow. Now, in our Video Marketing Academy, we have different formulas that we use for different types of videos. Let me just show you a very simple one that is Janet’s 7 Steps to Absolutely Everything in Life. You want to make sure that you’re welcoming the viewer. You, then, want to establish some kind of credibility straight-up. You want to be able to give them a reason to keep on watching, so there’s a little bit of a hook. You, then, want to be able to share a little bit of a story behind, so that people can relate to you. Of course, in a short video, this is only going to be very, very tiny. Then, you want to let people know what the problem is, so they know that you understand their problems. The bulk of your video is going to be on giving content, on giving the solution, and then the very last thing is you need to have a call to action. My call to action to you is if you would like some help with this, I’ve got great free training for you. 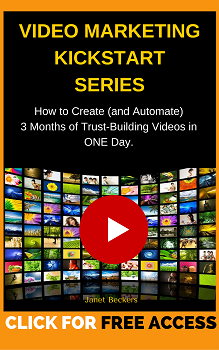 The best place to start is with our Video Leverage Checklist. That’s going to show you 33 different ways to absolutely knock everything you can out of a 3-minute video so that you get to be seen everywhere. That’s a great way for you to be able to start to get some help. I’d love to hear from you. What happens with you when you start shooting videos? Do you find yourself rambling? Does this 7-step process help you? Of course, we go into a lot of detail in actually how do you use those examples and the way that you’re going to be implementing that into your videos, of course, in that training, but that’s a really quick overview for you. Does that 7-step process help? Please, leave your comments down below. I’d love to hear from you. Any questions, any comments, that would be great.